After my birthday feast last month, Hello Kitty got herself some Russian caviar and wanted to share it with me. So on the last Sunday that I was spending at my "summer vacation home", we decided to crack open the jar and also pop the cork on some bubbly. We had some discussion about how best to go about consuming this precious ingredient, as we're both novices when it comes to caviar. The original suggestion from the supplier was to do it "the Russian way" which, presumably, involved blinis, sour cream, chopped onions, hard boiled egg yolks and whites...etc. Let's face it, that's a lot of work just to have a little fish roe! I was advocating the "purist" method, which would just be spooning the eggs straight into my mouth, or at most having it on some white toast. In the end we got ourselves some white "milk toast" from Little Mermaid Bakery and spread some unsalted butter or crème fraîche on top. Now that we got the condiments fixed, the serving utensil was also an issue. It's well-known that one should not use utensils made of metal, for fear of imparting any metallic tastes and spoiling the original flavors of the eggs. Unfortunately I didn't have any mother-of-pearl spoons lying around, and after contemplating everything from clear plastic spoons from Cafe de Coral (大家樂) to the tiny "Tweetie" spoon I found lying around in the kitchen, Hello Kitty managed to pick up a few flamingo-topped glass spoons at Zara Home. I cracked the jar open and scooped out a spoonful of the oscietra caviar, which wasn't completely black in color. Taking the first mouthful "as is" without any condiments, I found it to be delicate in flavor, with a hint of smokiness. The big surprise was the level of salt, since quite a few of my earlier memories of sturgeon caviar involved highly salted eggs. Well, the lid of the jar did say "malossol", which meant there was a minimum of salt being used to preserve the eggs. I used my tongue to push the eggs up against the roof of my mouth, trying my damnedest to pop them. The membranes seemed thicker than I had expected, and it took considerably more effort to get the job done. The contents were nice and creamy, and... dare I say... tasted like smoked sturgeon...? I took more of the caviar, sometimes with butter or crème fraîche on toast, but in the end I decided that I prefer the eggs on their own, with bites of toast afterwards to cleanse my palate. 2006 Louis Roederer Brut Nature, dégorgée à 18 mars 2014 - nose of green apples and a little bit of toast. Made with 2/3 pinot noir, this wasn't as acidic on the palate as I had expected, even though there is no dosage. Not quite rounded on the palate, but it's very well-balanced and well-made. Sipping it with bits of caviar in the mouth really brought out the smokiness. A very decadent way to spend Sunday afternoon... sitting by the pool and indulging in Champagne and caviar. Now that we have a friendly supplier, I'll have to get a few more varieties and do a proper comparison... after I've saved up more money. P.S. 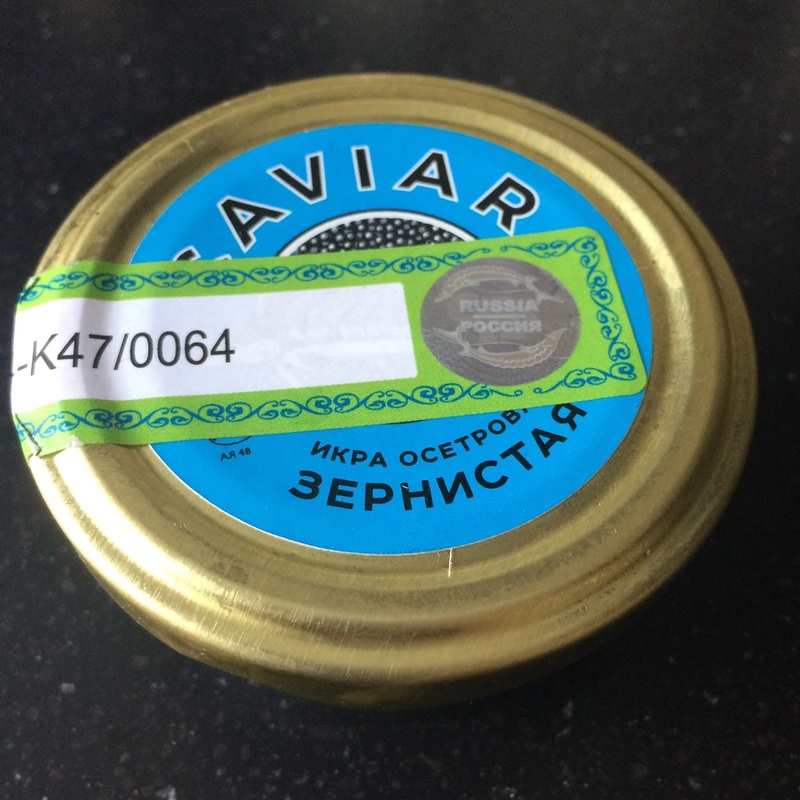 We were told by the supplier that the farmers have come up with a method to extract the caviar from the female sturgeon without killing them, so I'm very happy that this is now sustainable.